The New York Times finally is putting in writing the truth facing many new veterinary students. It shouldn’t surprise you though. Jennifer Robinson, a student at Ross, practices holding a dog to control its head and leg while a catheter is inserted. They don’t teach much at veterinary school about bears, particularly the figurative kind, although debt as large and scary as any grizzly shadows most vet school grads, usually for decades. Nor is there much in the curriculum about the prospects for graduates or the current state of the profession. Neither, say many professors and doctors, looks very promising. The problem is a boom in supply (that is, vets) and a decline in demand (namely, veterinary services). Class sizes have been rising at nearly every school, in some cases by as much as 20 percent in recent years. And the cost of vet school has far outpaced the rate of inflation. 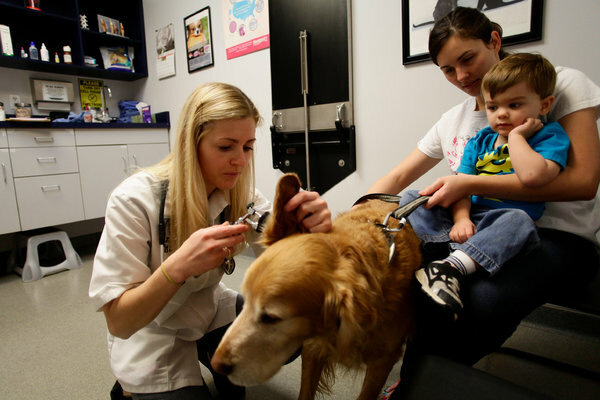 It has risen to a median of $63,000 a year for out-of-state tuition, fees and living expenses, according to the Association of American Veterinary Medical Colleges, up 35 percent in the last decade. This would seem less alarming if vets made more money. But starting salaries have sunk by about 13 percent during the same 10-year period, in inflation-adjusted terms, to $45,575 a year, according to the American Veterinary Medical Association. America may be pet-crazed and filled with people eager to buy expensive fetch toys and heated cat beds. But the total population of pets is going down, along with the sums that owners are willing to spend on the health care of their animals, one of the lesser-known casualties of the recession. The current president of the veterinary medical association, Dr. Douglas G. Aspros, isn’t talking about unmet needs. Instead, he sounds like a man ready to rethink many of the premises his organization has long espoused. When you factor in cost of living and commuting costs, Ross is one of the more expensive places in the world to get a degree. And Ross mints D.V.M.’s at a remarkable clip. Last year, it graduated 287 of them — triple the number of many American schools. ROSS is on the southern coast of St. Kitts, an island that once did a robust trade in sugar cane but today earns much of its money through tourism. The campus is a five-minute drive from the harbor town of Basseterre, where a cruise ship is often anchored. The hodgepodge of lecture halls and small labs are scattered around a grand, triangular-shaped outdoor amphitheater in front of the student union, with an unobstructed view of the sea. One afternoon in January, Dr. Kathleen Yvorchuk was teaching a course called Introduction to Physical Exam. That day’s lesson was the correct way to check a horse for a sinus infection. The trick is to knock on the bone that runs above a horse’s muzzle — knock hard, like that bone is a door — and then listen. The students took turns knocking on the forehead of Chocolate, who seemed impervious, as well as sinus-infection-free. Students spend seven semesters at Ross, one after another, without summer breaks. This allows them to get through the program in less time, but to critics, Ross is a bit like a factory that is constantly building up production. This same criticism has also, in a milder form, been leveled at many of the 28 vet schools in the United States. There are roughly 91,000 working vets in the country, about one-tenth the number of M.D.’s. But this relatively small universe is expanding rapidly. State budget cuts have led many domestic schools to make up lost revenue by adding students, in some cases by 10 percent in one year. Four more vet schools, both public and private, are either in the planning phases or under construction, one in New York, two in Arizona and one in Tennessee. If all are ultimately built, there will be thousands of additional D.V.M.’s on the market in coming years. At the same time, the veterinary medical association’s Council on Education has picked up the pace of its accreditation of foreign schools, like Ross on St. Kitts, giving its imprimatur to 10 of them since 2000. The goal, says Dr. Aspros, the association’s president, is to make the United States the global standard setter for veterinary medicine. He defends this practice by noting that you don’t need a diploma from a school accredited by the association to practice in the United States; graduates from unaccredited schools simply have to jump through a few additional hoops. But the association’s seal of approval means students can qualify for federal loans. Because tuition at foreign schools is not subsidized by any states, graduates from places like Ross tend to wind up with larger-than-average debts. For Dr. Schafer, the burden of her student loan has dictated some crucial decisions, including where to live. After she graduated from Ross in 2011, she wanted to head home to San Diego, but she realized the city was too expensive, given her debts. She has a sister who lives in Scottsdale, so she settled on Arizona. It took an intensive, monthlong search to find a job. Her technique was to walk unannounced into a clinic — she eventually visited a couple of dozen — and introduce herself to anyone who seemed to work there. She got lots of sympathetic smiles and heard many variations of “We’re not hiring.” She finally found Caring Hearts through a help-wanted ad, and beat out 30 other applicants. The job pays well — $60,000, which is higher than the average starting salary for vets in this country. Her days now start at 7 a.m. and are booked until 7:30 p.m. with new-puppy exams, emergency surgeries and anything else that rolls in the door. Her childhood mission to become a veterinarian was no whim. Soon after she made that sign, she started collecting animals on the 11-acre plot in the town outside San Diego where she grew up. Not just dogs, cats and a horse, but also chickens, fish and iguanas. Today, her debt exceeds her salary by a factor of five — much higher than the recommended twice-starting-salary ratio. She signed up for income-based repayment, a government program available to federal student loan recipients. (A newer program with slightly more generous terms, called Pay As You Earn, or PAYE, is available to more recent graduates.) Both income-based repayment and PAYE allow graduates to lead relatively normal lives by paying back a modest percentage of their income based on a formula. After a fixed amount of time, from 10 to 25 years, the balance of the debt is discharged. That’s the good news. The bad news is that the interest on the debt keeps growing and taxes must be paid on the amount discharged, as if it is a gift. Dr. Schafer sends $400 a month to Sallie Mae, a sum that will rise. But what kind of tax bill awaits her? Asked to run the numbers, GL Advisor, a financial services company that specializes in student loans, calculated that Dr. Schafer’s debt is likely to exceed $650,000 when her tax bill lands 25 years after the start of the loan, which means she will owe the Internal Revenue Service roughly $200,000. That will happen while she is still deep in her career, perhaps around the time she wants to send some children to college. Getting admitted to Davis would have cut her tuition bills more than 50 percent. But she never balked at Ross’s offer. Though Ross is rarely anyone’s first choice, even detractors say its educational standards are high and its graduates are impressive. But the commuting costs, the foreign setting and the faint stigma that attends education at profit-making institutions have made it a school of last resort. If getting in is easy, staying in is surprisingly hard. About 20 percent of Ross’s first semester students won’t make it to graduation, say administrators, an exceptionally high rate of attrition. (At American schools, it’s typically closer to 2 percent.) About half of those students are bounced for poor academic performance. Dean Watson says most students flunk out early on, in the first and second semester. But some fail much later. In 2006, Diana Reyes was ejected in her sixth semester, leaving St. Kitts with $160,000 in debt and no degree. “It was one of the saddest moments of my life,” she says of the day she learned the news. She took a break, then borrowed more money to earn a technical degree from Purdue University. Today she earns $18 an hour as a technician in a veterinary clinic in Lafayette, Ind. THE poor job market for new veterinarians is not the much-publicized fiasco that it is for new lawyers. But it’s getting worse. For decades, new D.V.M.’s were snapped up by clinics and hospitals in the months before they graduated. In 2012, a mere 45 percent of graduating vets reported that they had accepted a permanent job offer — as opposed to a time-limited and lower-paying internship, or a residency — down from 84 percent in 1999. Last year, 39 percent of graduates had no job offers, up from 19 percent in 1999. But after graduation, little data is collected about employment and salaries. Nobody knows the number of unemployed and underemployed vets. Vet-market optimists have long argued that many parts of the country are underserved. And if you look at a map of where vets set up practices, you will see large areas of the country with little or no coverage. To address this problem, many states and the Department of Agriculture have offered loan-forgiveness programs, hoping to lure new graduates to places where vets are needed. Success stories are rare. Even with government assistance, it is hard to make it financially as a vet in areas that are both sparsely populated and poor. But even if she qualified for loan forgiveness, she says, it wouldn’t have made much difference. During the winter, her phone often didn’t ring for days at a time. During the spring, she once worked 42 days in a row. The feast-or-famine pace was trying enough, but even worse was that many of her clients, though devoted to their animals, often couldn’t afford needed care. So recently she moved. She beat out hundreds of vets who applied for a job at a clinic in Northern Virginia, where she will work mostly on high-priced horses, and where a vet can charge more, even for vaccines. It’s slowly dawning on leaders in the field that vet schools can’t simply increase the number of graduates and expect them to move to underserved areas, hanging shingles where there currently are none. The last refuge for rosy forecasters is the most recent Bureau of Labor Statistics report. It states that “overall job opportunities for veterinarians are expected to be good.” As Ross’s public relations office points out, the report’s data suggests that the country will need 22,000 new vets by 2020, far more than will be produced under the current system. But many people believe that the bureau’s report, which was written in 2009, is badly in need of an update. One of them is Henry Kasper, the economist at the Bureau of Labor Statistics who helped draft the report. There are others. That belief has been tested. Not only are there fewer dogs — from 2006 to 2011, the number of dogs in the country dropped for the first time, albeit slightly, to 70 million from 72 million, according to the American Veterinary Medical Association Sourcebook survey — but the amount owners paid to vets fell, too. Owners reported they spent about $20 less a year in inflation-adjusted terms in that five-year span. The horse market has suffered the most. Pet horses are expensive, and the market for them since the start of the recession has been crushed. Thoroughbred racing, meanwhile, has been hurt by the expansion of casinos, reducing the number of horses in need of veterinary care. There is no simple solution to the problem of sinking salaries and rising debt, nor to the market saturation of vets, Dr. Aspros says. Tuition is expected to keep going up, class sizes are expected to grow and if new vet schools are built to the proper specifications, they will get the veterinary medical association’s seal of approval. An added wrinkle to the debate is gender. The number of women in vet schools has been rising for decades; today they account for 80 percent of graduates, flipping the gender mix on its head as compared to 30 years ago. As with most professions, there is a pay gap between men and women, and in the veterinary field it has widened since the downturn. Last year, starting salaries for women were 16 percent lower than for men, according to figures compiled by Dr. Myers of JustVetData, compared to a 3 percent difference in 2002. Everyone is losing ground, she says, but women are losing ground much faster than men. DISCUSSIONS about these and other vexing issues are conspicuously absent in most vet schools, say academics. Dr. James Wilson, a veterinarian, lawyer and professor who has taught at more than a dozen vet schools over the years, says he is consistently amazed at how little students know about their financial future. What Dr. Wilson learned long ago is that it is hard to talk anyone out of vet school. Many students, like Dr. Schafer, set their hearts on the job at an early age. If you are doing what you have always wanted, and you find it fulfilling, the numbers don’t seem relevant. At least initially. She realizes that this is crazy. The bear that is her tuition bill has an appointment in about 23 years, and that is the one beast she doesn’t know how to treat. A version of this article appeared in print on February 24, 2013, on page BU1 of the New York edition with the headline: The Vet Debt Trap.